Eat by colour and keep it simple: that’s all you need to know to make this easy side dish. 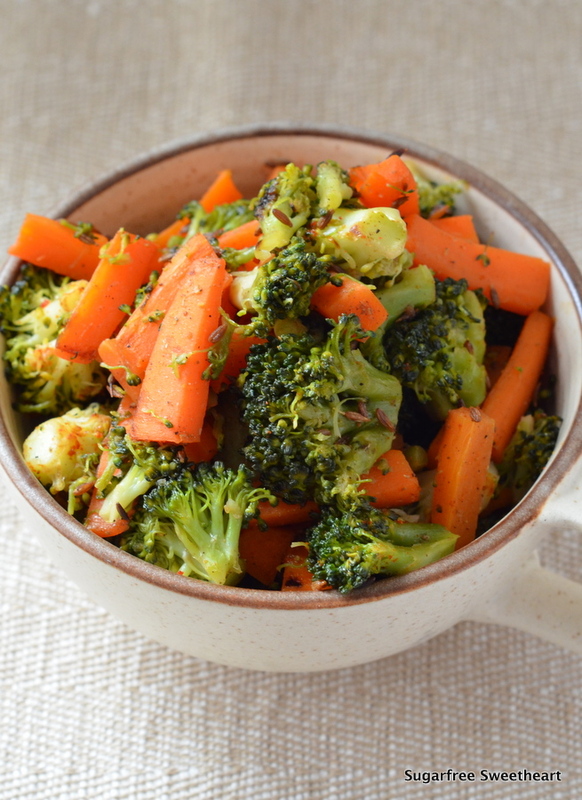 This Broccoli & Carrot Subzi focus on the tastes of the two vegetables themselves with only a little help from the spices. I’ve decided to start with the basics this year and understand how flavours build from the fewest ingredients. 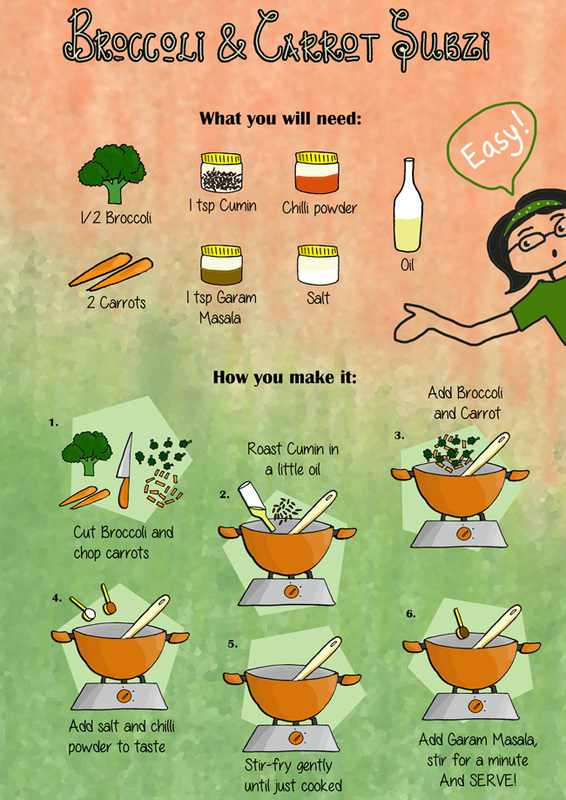 Broccoli is not a usual participant in Indian recipes, but its similarity to cauliflower makes it an easy substitution. And it goes well with carrots too, giving us two of the four colours on the Indian Flag! Silly trivia apart, Broccoli is a crazily healthy vegetable: great for bone health, vitamin C, immune health, heart health, and for feeling full, amongst other benefits. Add to this the benefits of carrots, right from Vitamin A for your eyes, skin, and liver, to the soluble fibre that helps reduce cholesterol, and the carotenoids that take care of heart health. You’ve got a boost to pretty much your whole system from this combination of vegetables. This recipe is suitable for diabetics, cooks in a hurry, and minimalists! On Returning to Blogging: The Struggle and The Compromise! Yes, I’ve been dormant for a long time now, more than a month, and a lot more than I had planned for. Sorry about that, dear readers. In the second half of December I took a break from the internet. I spent most of my free time in January trying out various ideas for the new recipe illustration format. I hit a road block a few weeks ago when my amateur skills with Photoshop were unable to keep pace with my own demands for a useful illustration library. I fretted about it uselessly for a while before deciding to work around the problem and just get something up on the blog soon! Another reason that I’ve been struggling to get back to blogging is that I have now begun to write fiction full time (10 to 4 everyday) so by the time I sit down in the evening to write posts and create illustrations my creative energy levels are somewhat depleted. And the final factor contributing to my difficulty was trying to find a worthy recipe to share with you. As you can see from this recipe above, I’ve decided to stop looking for fantastically amazing recipes and instead focus on posting about the food that I do cook and like, simply to ensure that I keep the habit of blogging. Hopefully the worthy recipes will slowly trickle in once I have the posts coming in regularly! That’s all the excuses I have for you today! Here’s wishing you a successful and fulfilling 2014! Simple, healthy and quick! Love this recipe. All the best, it is demanding and draining, so more power to you! Thanks Archie! It’s only been a month since I started writing and I can already see how hard this is going to be for me. But I’ve decided that this year is going to be all about patience… and I’m finally ready to sit down and work on it everyday. I hope it leads somewhere worthwhile. nice and simple combination, the illustrations look so good! Thanks Pavithra! I saw your email just yesterday, thanks for checking in on me! 🙂 Working on a novella at the moment, and the next project will be a book. I’ll fill you in once I have a readable draft ready!